The Best Press Pack Ever. Will you just look at what was in one of the parcels I picked up last week? This has to be the best press pack ever! To celebrate thirty years of flying between London and Los Angeles, Air New Zealand sent me this brilliant retro bag filled with goodies from 1982. (Well, not strictly 1982, but the thought was definitely there!) 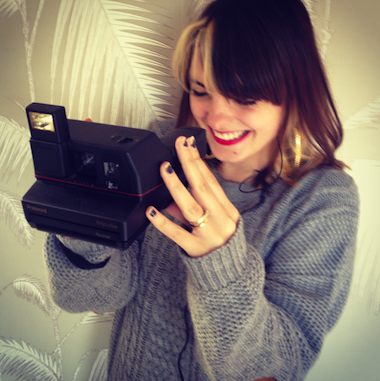 I am now the proud owner of a proper Polaroid camera, a Sony Walkman and a mix-tape! And guess who turned up just as I was opening my bag of retro delights? Little sister Kate, @crillystyle! Kate dresses as though she’s permanently in the eighties, so it seemed a perfect opportunity for her to model my Air New Zealand electronics. 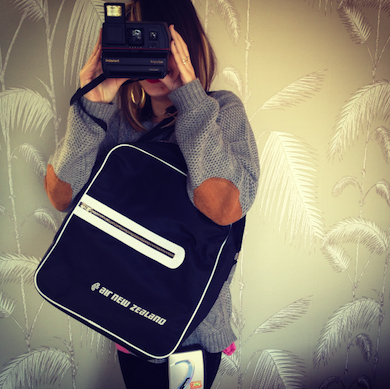 Here she is with bag, walkman and Polaroid camera – one gigantic hoop earring just visible. Anyway, I must get back to listening to my mix-tape – Olivia Newton-John is wailing out from the Walkman earphones! 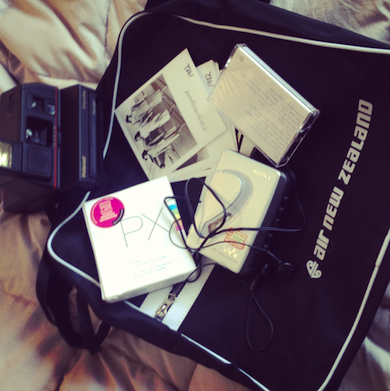 Have a look at Air New Zealand’s blog, I am Packed. It peeks inside people’s suitcases. Addictive.